The Coalition’s purpse is to bring together many partners to advance our shared mission. Membership is open to any person, organization, nonprofit, or institution interested in work surrounding HPV. Our goal is to reduce the incidence of HPV and HPV-related cancer by increasing understanding of the connection between HPV and cancer, and by increasing statewide HPV vaccination rates. Educate medical providers about the HPV burden and connection to cancer, increase their skill in using evidence based strategies for talking to parents/patients about HPV; improve practice procedures to increase vaccination rates. Education dental providers about their role in HPV prevention; increase knowledge of HPV disease burden; increase skill and comfort in discussing HPV with patients. Educate the public (parents, families, students, others) about the HPV disease burden to decrease stigma and effect change in HPV vaccination rates. Be a resource and model for collaboration across specialties to effect change. The Coalition has partnered with Cervical Cancer-Free America to act as the Massachusetts chapter! By joining the Coalition, you are also becoming part of a nationwide effort to create a Cervical Cancer-Free America! There is no cost or specified time obligations for members--our goal is to create a forum and collaborative in which our voices are all heard. Free promotion for your organization/institution/initiative--the Coalition website has been created as the first step in creating a single, centralized platform accessible to those most passionate about collaborating to achieve common goals, not just those with the most resources. By joining a network of like-minded organizations/institutions/advocates with the same goals, you will inevitably be exposed to new initiatives, research developments, public information campaigns, and events that resonate most with your priorities. Whereas a single entity may struggle in some aspects of their work--such as gaining the attention of policy makers and the public--a coalition of many members strengthens the collective voice speaking up about HPV/Cervical Cancer. We've seen this approach work on similar issues. While this is a new undertaking for HPV/Cervical Cancer Awareness, building a coalition is a proven method for increasing awareness and generating results. 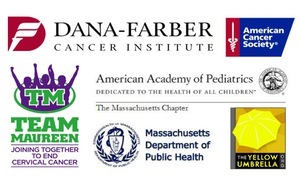 The Coalition is an independent professional association, whose founding members are comprised of: Team Maureen, the Dana-Farber Cancer Institute, the Massachusetts Department of Public Health, the Massachusetts Chapter of the American Academy of Pediatrics, the American Cancer Society-New England Division, and the Yellow Umbrella Organization. The hosting of the Coalition website has been donated by Team Maureen.